Listen here for audio of radio interviews about films from a Christian perspective with Pastors Ted Giese and Todd Wilken on IssuesEtc.org where Christianity meets culture. Click the IssuesEtc banner below to hear the radio interview. 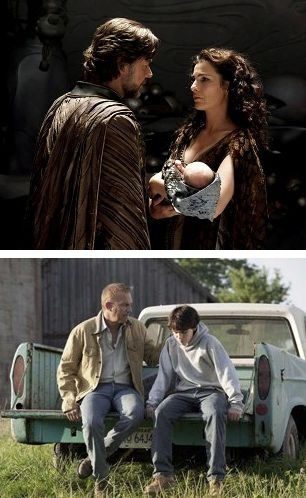 Warner Brothers released Man of Steel over the 2013 Father’s Day weekend and in an attempt to market the film as a father/son family outing, the studio aided in producing special resources to accompany the film’s release. This isn’t too unusual. Many film studios create an online campaign that will generate additional buzz in advance of a release date. The first week of a film’s run is one of the most important as it determines how long the film will be shown in theatres and how many theatres it will be shown in. This, in turn, maximizes the revenue the film will generate. So what’s so interesting about the Warner Brothers on-line advertizing strategy for the Christian viewer? CNN reports that as part of the online advertisement strategy Warner Brothers studio helped produce a website to promote the film specifically to Christians. 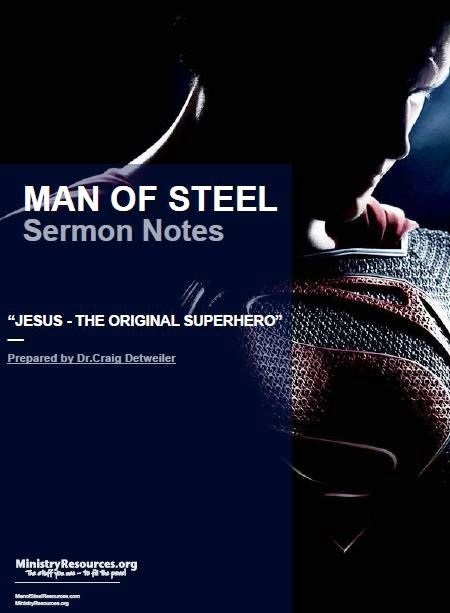 On this website the studio provided sermon notes for pastors to use Superman as an illustration while preaching on Father’s Day. It appears Warner Brothers wished people to draw a connection between Superman and Jesus and they hoped these resources would facilitate this conclusion. The sermon notes the studio provided suggested that congregations watch the movie trailer in their church during the sermon. This sort of marketing is unsettling, but what’s more unsettling is that the Jesus they are drawing the connections with is a truncated Jesus selectively found in Scripture more akin to the ‘Jesus’ of pop culture than to the Jesus of Good Friday and Easter Sunday. Warner Brothers wasn’t acting alone in this endeavour. To accompany the film the American Bible Society produced a special Father’s Day “Talking Points” PDF. This PDF was also made available on www.manofsteelresources.com. At one point the document says, “Where Man of Steelbegins, the New Testament presses deeper still. A hero who came to save humanity is also one who was there during its creation. He’s more than just a champion against evil; he’s a powerful example of what is good. As a father, you should be striving to live out this example every day. You can be that hero for your son or daughter by giving them unconditional love and support.” How does this all factor into the film and what other concerns might a Christian watching this film have? 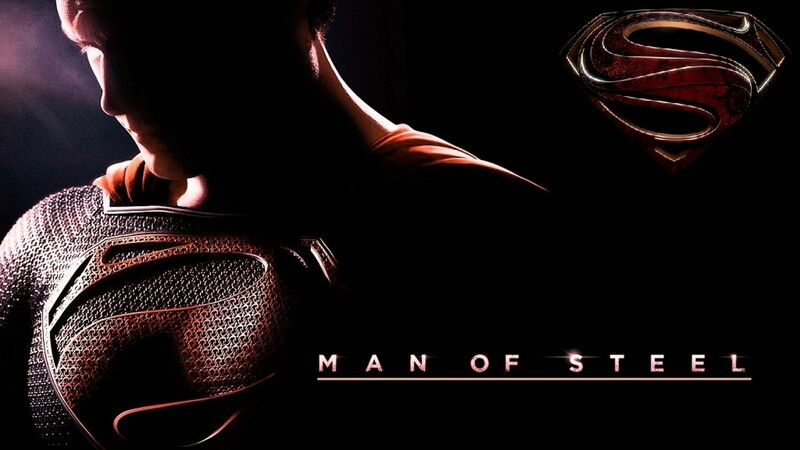 Man of Steelis a sci-fi super hero film about a child of two fathers. One is the embodiment of Nurture, the other the embodiment of Nature. The young Clark Kent is the adopted son of Jonathan Kent (Kevin Costner), a farmer from rural Kansas, while the same boy, who’s alien name is Kal-El, has a biological father, the space alien named Jor-El (Russell Crowe), from the planet Krypton. Once the boy is grown he becomes Superman, the Man of Steel (Henry Cavill). As an adult, after his full identity is revealed to him, he must decide whose son he is; on the one hand, because of his unique biology, Superman has physical abilities that confound the laws of physics, while on the other hand he is studied in the careful and conscientious humility of a farm boy brought up to be both respectful and dutiful in society. As the film unfolds, this boy growing into a man must decide if he will side with the people of his biological heritage and allow the eradication of humanity to ensure the survival of the last remnant of the Kryptonian aliens or whether he’ll side with his adopted humanity and fight to protect humanity against the last of the Kryptonians led by the zealous general Zod (Michael Shannon). To complicate matters he’s an outsider to both of these competing interests. On paper this sounds like a compelling story; as a movie trailer it was very compelling. As presented in the context of this particular film the story is less compelling. It comes across as disjointed and heavy-handed and, apart from Jonathan Kent, the characters are nearly two dimensional and their motivations not always well conveyed. For instance, the antagonist, General Zod, is revealed as being not simply driven by zeal for a cause – the survival of the people of Krypton – but rather he is literally unable to do anything different because he was genetically altered from conception to serve a single vocation. 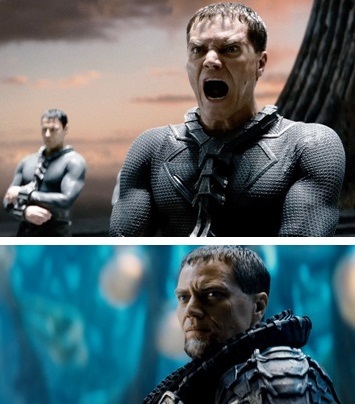 Unlike Superman, General Zod has no free will and when his only purpose for living is taken away he say to Superman, “You’ve taken away my soul.” Again, this is a very compelling idea to explore, but by the time the film gets around to fully revealing this idea the concept is lost amidst forty solid minutes of destruction, explosions and fighting. As to the theme of ‘making a decision’ in the context of Jesus’ life, Scripture teaches that Satan tempted Jesus to use His powers in an improper way following His baptism in the Jordan River. The resistance of this temptation could be seen as “making a choice” although it isn’t often talked about in this way. For 40 days Jesus was tempted in the wilderness but, unlike Superman, Jesus prevailed against His tempter. This is one of the stark differences between the Jesus of Scripture and fictional Superman of Man of Steel, and one of the key places where the analogy of Superman as “Christ” breaks down. Within the film there’s a pivotal scene in which Superman kills an enemy where he could have resisted this temptation and spared that life. This scene doesn’t sit well with many viewers. When exploring the theme of ‘purpose driven’ living, Man of Steel draws on a long standing pop culture misconception as to the main purpose of Jesus’ life – that His central purpose was to be a moral teacher and example towards moral living. Jor-El echoes this in his vision for his son. The Bible teaches that Jesus is more this: He literally gives His life to die for humanity. Jesus does this to save people from more than temporal death. He does this to save them ultimately from everlasting death. In fact, Scripture depicts Christ Jesus’ fight for humanity as a fight won with personal sacrifice, humility, and conviction tougher than steel. Jesus won His fight with humanity’s enemies at the cross without throwing a single punch. Isaiah prophetically talks of Jesus saying that He “was pierced for our transgressions; He was crushed for our iniquities; upon Him was the chastisement that brought us peace, and with His wounds we are healed.” Jesus did not fight with physical might against the enemy. For this reason the Jesus of the Holy Bible is starkly contrasted with the fictional Superman of Man of Steel, who at no time is depicted as truly putting his life on the line to save humanity. This narrative contradiction makes the desire to draw a connection between Jesus and Superman one of the film’s weakest points. Another unsettling point is the sheer level of destruction found in the film’s last hour as Metropolis is demolished by the invading General Zod in his confrontation with Superman. Amidst buildings collapsing and twisted wreckage an intern from the Daily Planet newspaper exclaims that Superman “saved” them. As a filmgoer in a post 9-11 world it’s hard to see buildings collapsing suddenly and not think that there would be people inside those buildings dying by the thousands. As a result, the words of the intern concerning Superman’s power to save ring false and disingenuous. On 9-11 people had time to get out of the buildings, yet thousands of people tragically died. This is where some would be quick to point out that this is just a movie and the viewer need not be too concerned about this as it’s all accomplished with special effects and CGI. This might be a valid argument if these cinematic images of urban destruction weren’t cropping up so often. These unsettling images of destruction are entering films more frequently, from The Avengers to Iron Man 3 to Star Trek Into Darkness. The concerning thing is how they are portrayed regularly without equally portraying the cost in human life. 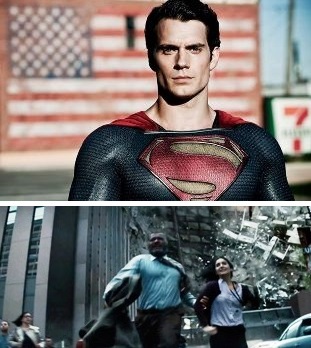 Man of Steel is relentless in this regard and, coupled with the enormous amount product placement and corporate signage from more than 100 companies ranging from 7-11 to Sears, Man of Steel presents a very real world setting devoid of real world consequences. In daily life suffering is a part of death; in Man of Steel depictions of real suffering are frequently avoided. This is not so in the Bible which depicts suffering as it actually occurs in life. Generally it would be unfair to hold a sci-fi super hero movie up to the standard of Scripture, but in this case it is fair because of the way Warner Brothers specifically used Scripture in an effort to court Christian viewers into the theatre. While Man of Steel has rocketed to the top of the box office “faster than a speeding bullet,” it theologically trips on its own cape in its attempts to draw a comparison between Superman and the Jesus of the Bible. It is admirable to desire to lift up the vocation of fatherhood in the telling of the Superman story and this is the film’s strongest component. But if you’re looking for the Biblical Joseph (Jesus’ adoptive father) in Jonathan Kent or God the Father (The first Person of the Holy Trinity) in Jor-El you’ll look in vain. Man of Steel is an ambitious film with impressive visuals however it is also a flawed film both in its execution and in its desired spiritually. Rev. Ted Giese is associate pastor of Mount Olive Lutheran Church, Regina, Saskatchewan, Canada; a contributor to Reformation Rush Hour on KFUO AM Radio, The Canadian Lutheran and Reporter; and movie reviewer for the “Issues, Etc.” radio program. Follow Pastor Giese on Twitter @RevTedGiese.